The Glorious Late-Byzantine city invites the visitor to journey through time and place. Mystras (Μυστράς) also known as Myzithras (Μυζηθράς) in the Chronicle of the Morea (*), is a fortified Byzantine town. Situated on Mt. Taygetos, near ancient Sparta, it served as the capital of the Byzantine Despotate of the Morea in the 14th and 15th centuries, experiencing a period of prosperity and cultural flowering. The site remained inhabited throughout the Ottoman period, when it was mistaken by Western travelers for ancient Sparta. In the 1830s, it was abandoned and the new town of Sparti was built, approximately eight kilometers to the east. Sparti and Mystras on the map. The red arrows show the incoming roads from the cities of Tripoli (T) & Kalamata (K) and from Mani (M). - Courtesy of Google maps. 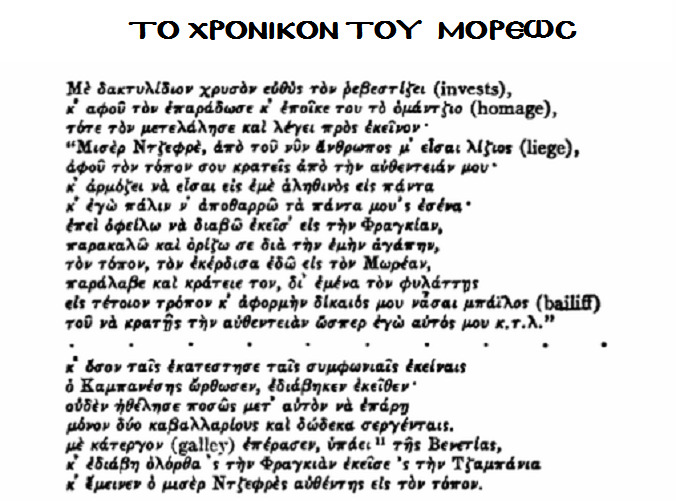 (*) The Chronicle of the Morea (Το χρονικόν του Μορέως) is a long 14th-century history text, of which four versions are extant: in French, Greek (in verse), Italian and Aragonese. More than 9,000 lines long, the Chronicle narrates events of the Franks' establishment of feudalism in mainland Greece. West European Crusaders settled in the Peloponnese (called Morea at the time) following the Fourth Crusade. The period covered in the Chronicle was 1204 to 1292 (or later, depending on the version). It gives significant details on the civic organization of the Principality of Achaia. 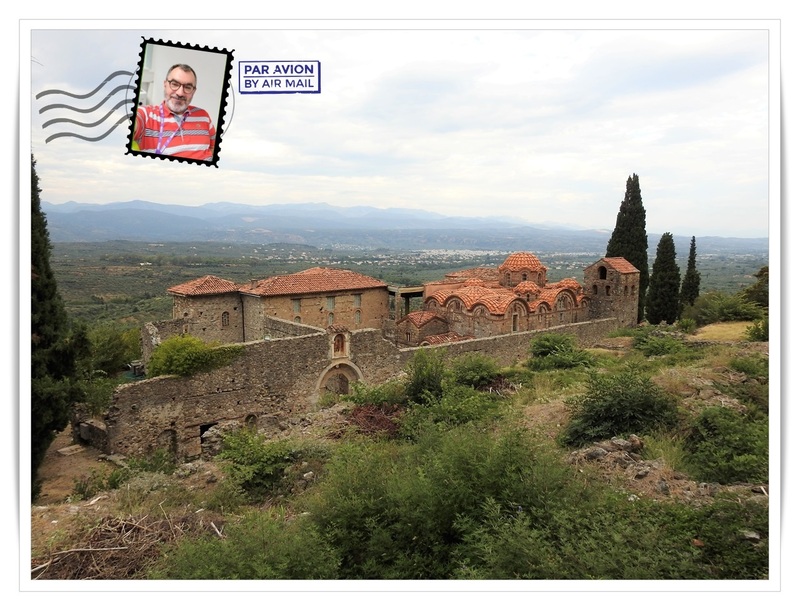 Located 220 km from Athens, Mystras is not qualified for a day trip for the Athenians. This is the reason I decided to visit this important archeological site the first day of my short-late-September holidays in Mani. 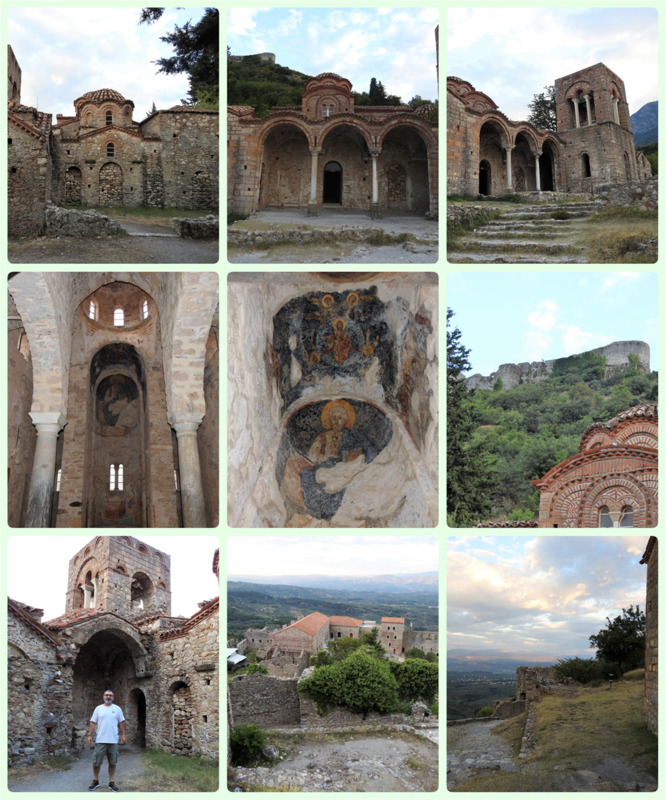 So, on my way to Mani, I stayed overnight at the village of Mystras. 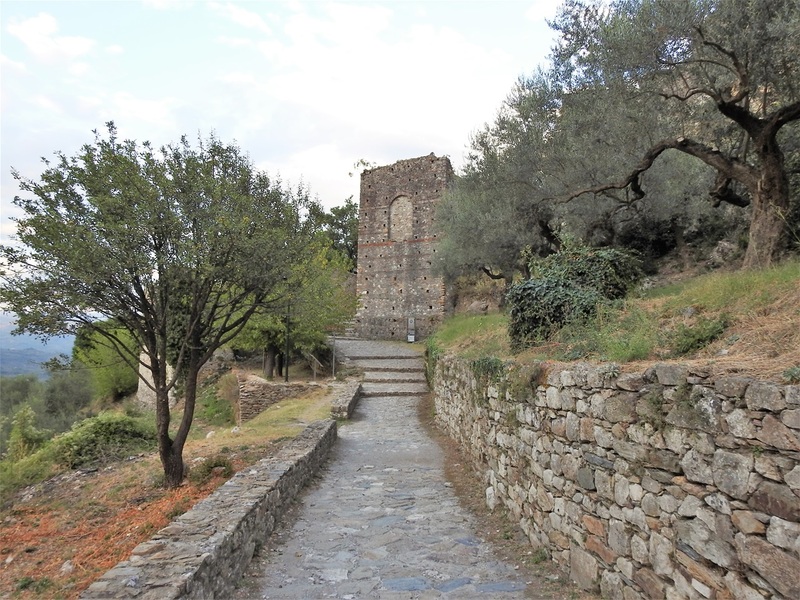 The village of Mystras should not be confused with the Byzantine fortified city with the same name. The village is a modern, beautiful and well preserved settlement with a very good tourist infrastructure, located only 1.5 km from the entrance to the fortified Byzantine town. There are many hotels and several restaurants in the area, for all those visiting the archeological site. I stayed at “Mystras Inn” hotel on the main square of the village. The hotel offers simple, but well equipped and comfortable rooms. Great breakfast is served at the restaurant of the hotel. 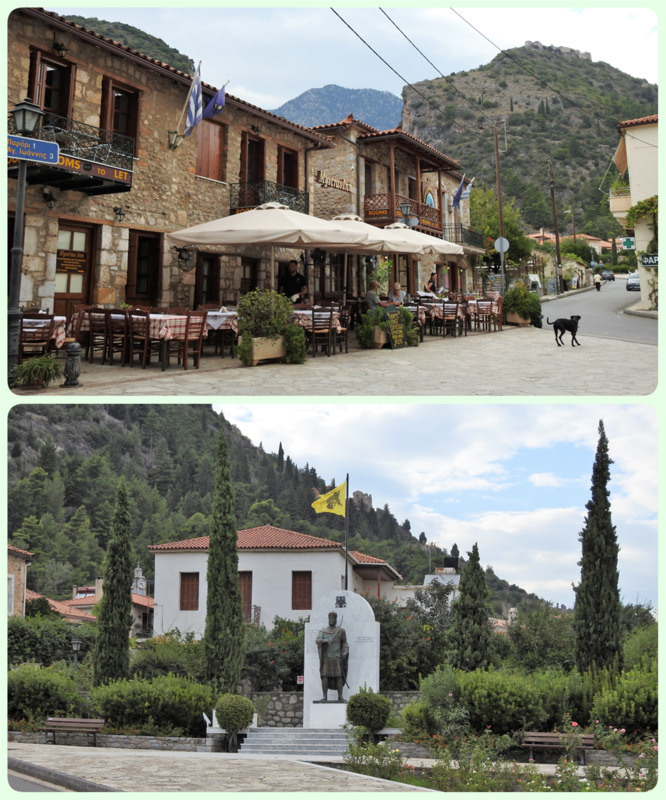 The Mystras village main square and the statue of Constantine Paleologos. In both pictures the Byzantine town-castle is seen at the background. We had some great food at the tavern of "Mystras Inn": veal in tomato sauce (right) and the famous in this area roasted piglet (left). Typical houses in Mystras Village. 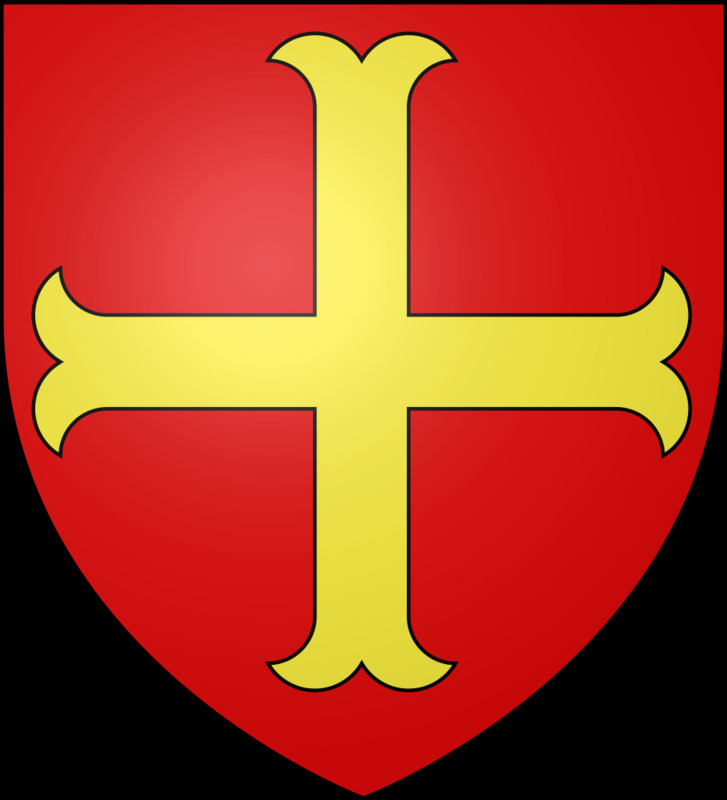 Coat of arms of the principality of Achaea. In late 1248, William II of Villehardouin, ruler of the Frankish Principality of Achaea, captured Monemvasia, the last remaining Byzantine outpost on the Morea. This success was soon followed by the submission of the restive Tsakones on Mount Parnon, the Slavic Melingoi tribe of Mount Taygetos, and the inhabitants of the Mani peninsula, thereby extending his sway over all of Laconia and completing the conquest of the peninsula, which had begun in 1205, in the aftermath of the Fourth Crusade. Laconia was incorporated into the princely domain, and the young prince passed the winter of 1248–49 there, touring the country and selecting sites for new fortifications such as Grand Magne and Leuktron; finally, near his residence of Lacedaemon (ancient Sparta), on a spur of Mount Taygetos, he built the fortress that came to be known as Mystras. In September 1259, William of Villehardouin was defeated and captured, along with many of his nobles, at the Battle of Pelagonia, by the forces of the Nicaean emperor Michael VIII Palaiologos. Two years later, the Nicaeans recaptured Constantinople, putting an end to the Latin Empire and restoring the Byzantine Empire. At this point, the emperor concluded an agreement with the captive prince: William and his men would be set free in exchange for an oath of fealty, and for the cession of Monemvasia, Grand Magne, and Mystras. The handover was effected in 1262, and henceforth Mystras was the seat of the governor of the Byzantine territories in the Morea. Initially this governor was changed every year, but after 1308 they started being appointed for longer terms. Almost immediately on his return to the Morea, William of Villehardouin renounced his oath to the emperor, and warfare broke out between Byzantines and Franks. The first Byzantine attempts to subdue the Principality of Achaea were beaten back in the battles of Prinitsa and Makryplagi, but the Byzantines were firmly ensconced in Laconia. Warfare became endemic, and the Byzantines slowly pushed the Franks back. 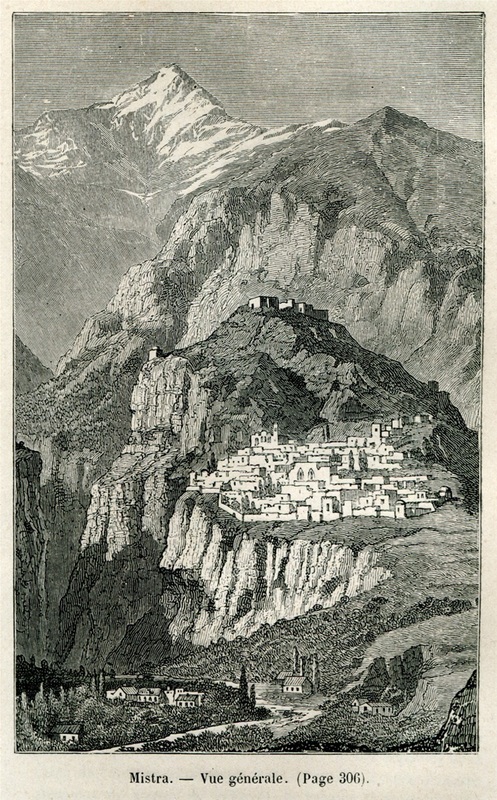 The insecurity engendered by the raids and counter-raids caused the inhabitants of Lacedaemon to abandon their exposed city and settle at Mystras, in a new town built under the shadow of the fortress. 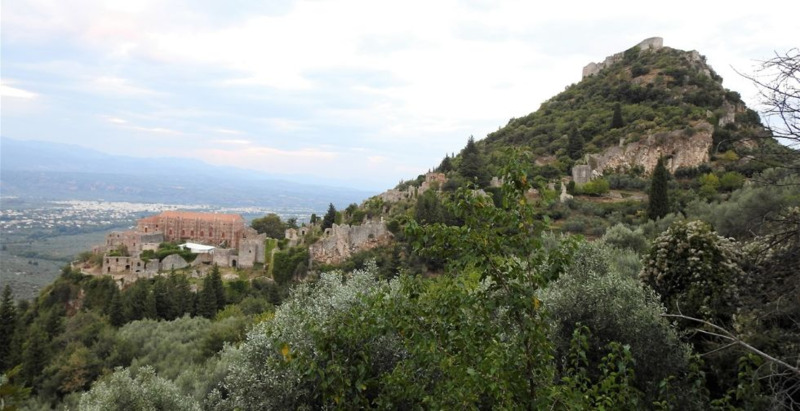 Mystras, general view. BELLE, Henri. Trois années en Grèce, Παρίσι, Librairie Hachette, 1881. 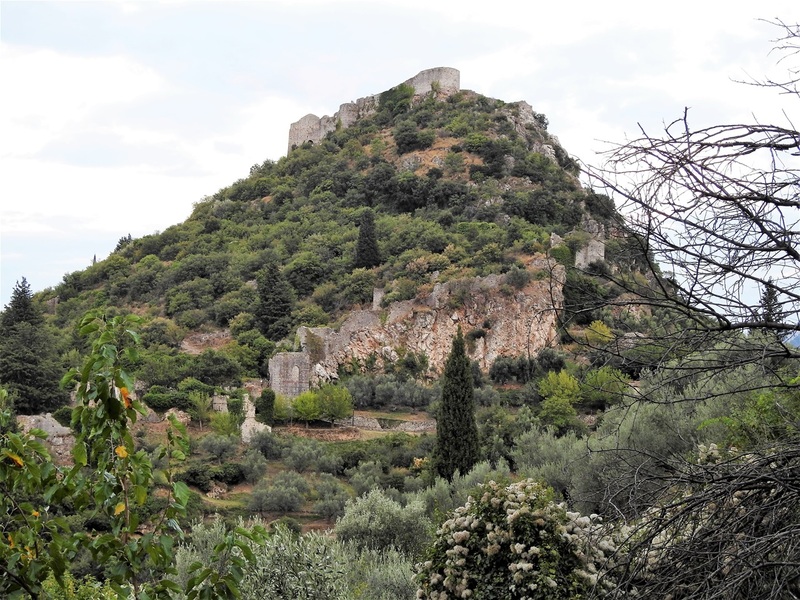 From 1348 until its surrender to the Ottoman Turks on 31 May 1460, Mystras was the residence of a Despot who ruled over the Byzantine Morea, known as the "Despotate of the Morea". 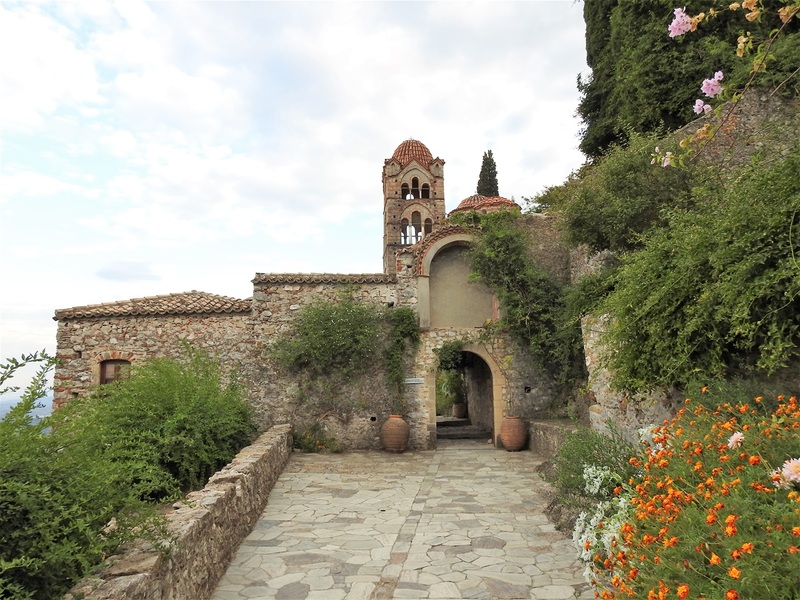 This was the city's golden age and Mystras "witnessed a remarkable cultural renaissance, including the teaching of Plethon, and attracted artists and architects of the highest quality". 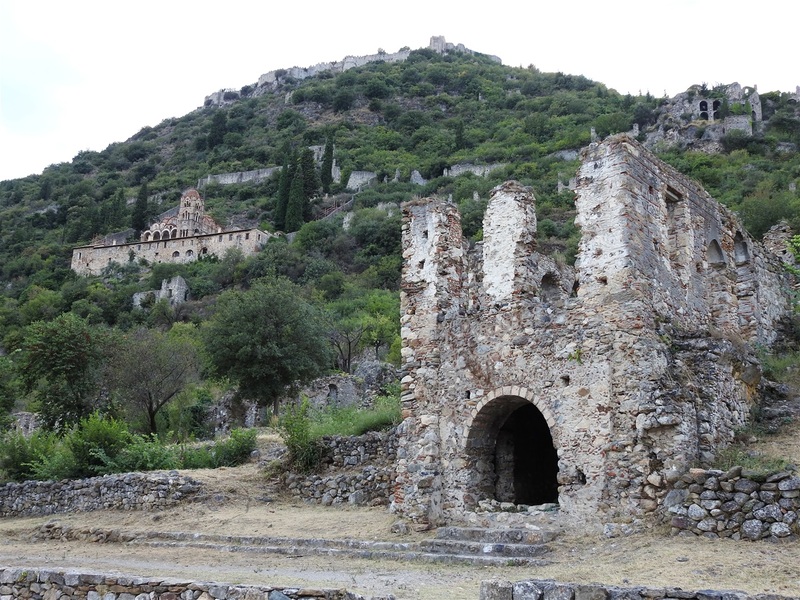 Mystras was also the last center of Byzantine scholarship; the Neoplatonist philosopher George Gemistos Plethon lived there until his death in 1452. 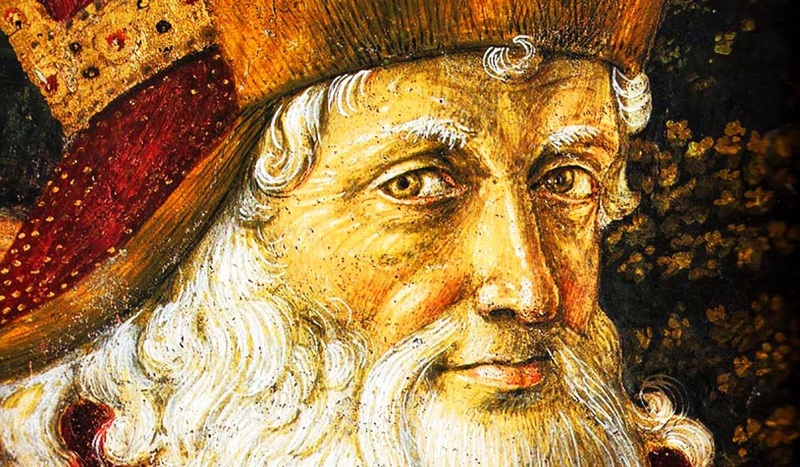 He and other scholars based in Mystras influenced the Italian Renaissance, especially after he accompanied the emperor Ioannis VIII Palaiologos to Florence in 1439. The last Byzantine emperor, Constantinos XI Palaiologos, was despot at Mystras before he came to the throne. Demetrius Palaeologus the last despot of Morea, surrendered the city to the Ottoman emperor Mehmed II in 1460. As Mezistre, it was the seat of a Turkish sanjak. The Venetians occupied it from 1687 to 1715, but otherwise the Ottomans held it until 1821 and the beginning of the Greek War of Independence. It was abandoned under King Otto for the newly rebuilt town of Sparta. 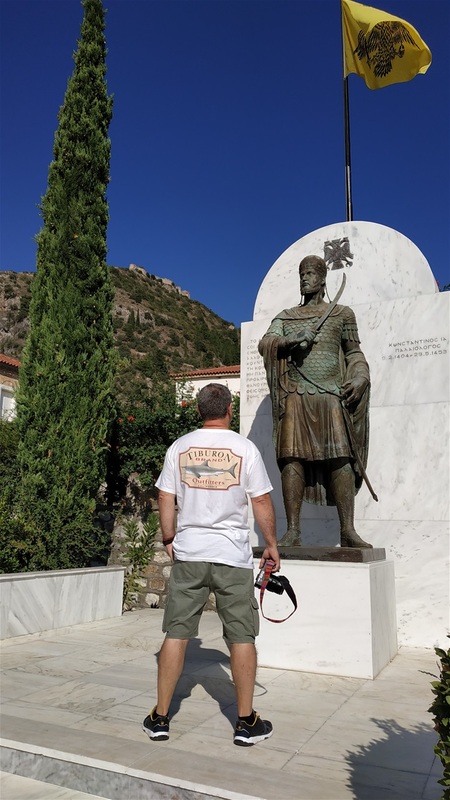 The statue of the last Byzantine emperor, Constantinos XI Palaiologos, in Mystras village. The fortified town of Mystras. There are two gates: G1 (main gate) and G2. 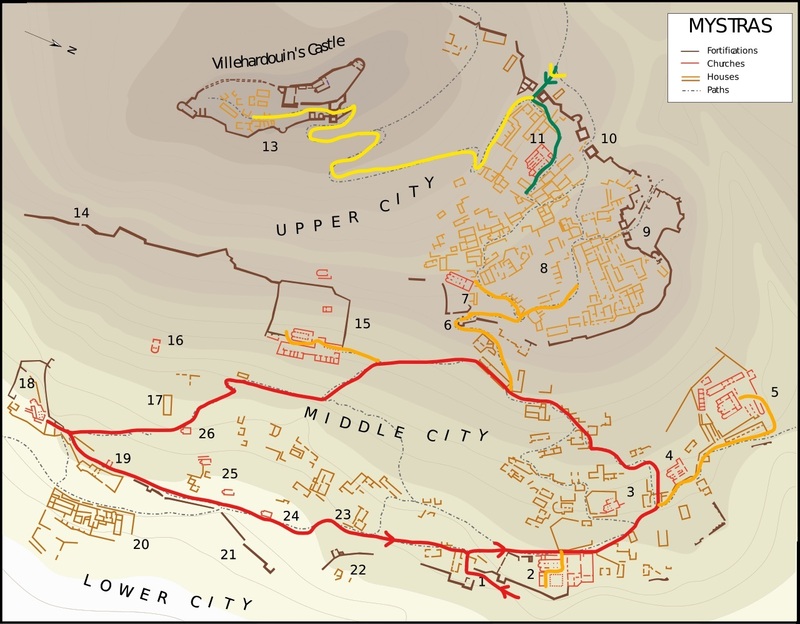 Red circular line shows the walking tour of the middle city and its detours (orange lines). Green and yellow lines show the walking paths to the upper city. 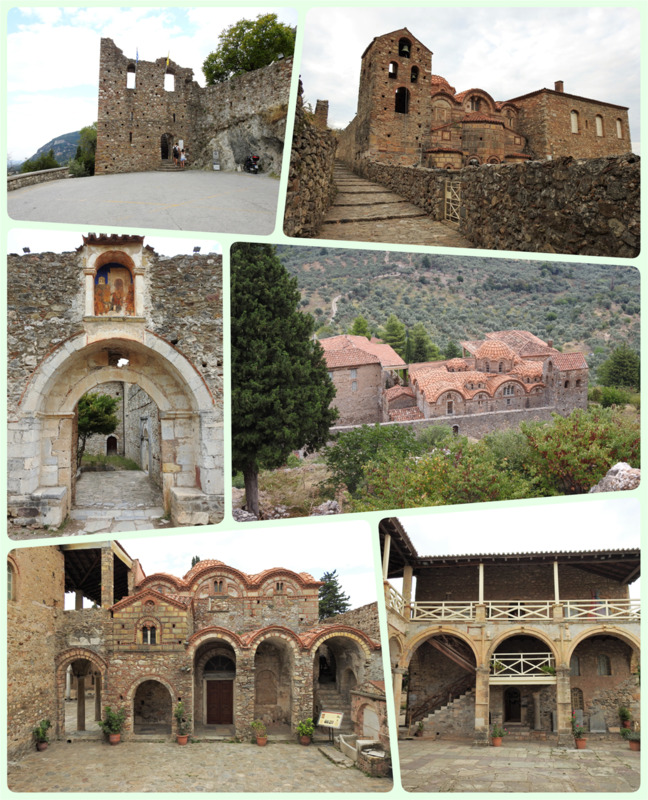 The Byzantine fortified city of Mystras is unique and attracts visitors from all over the world. The visitor, not only has the opportunity to walk in the streets of a late Byzantine town, but also to admire the beauty of the landscape. 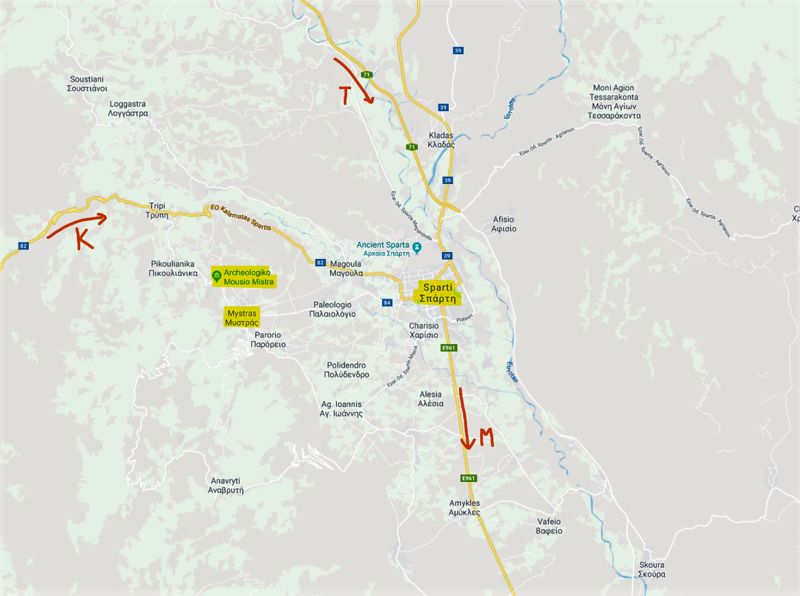 The town is built on a high and steep rock in the foothills of Mount Taygetos and provides great views over the verdant valley of Evrotas River and the city of Sparti (Sparta). The southern part of the hill is limited by a deep gorge that makes the town inaccessible from there. 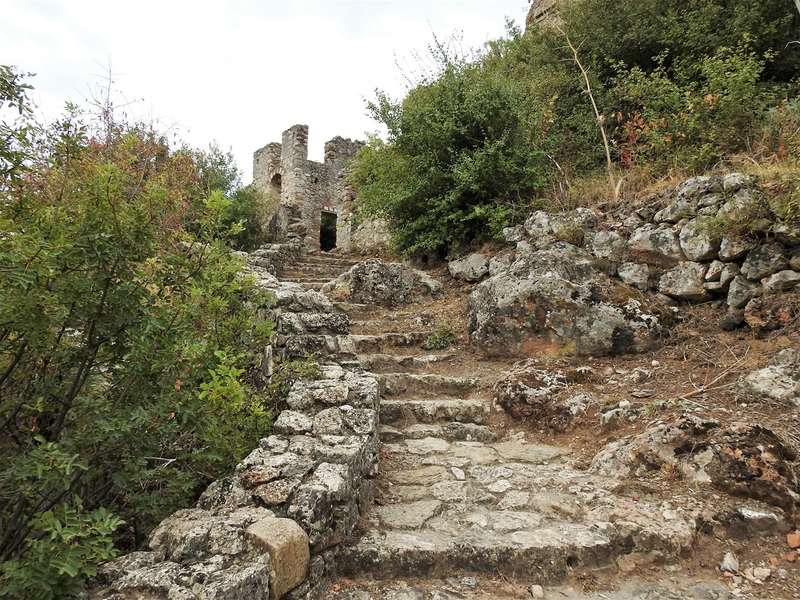 This Byzantine fortified city is situated on a steep slope and thus is not suitable for people with impaired mobility. There are two gates to the archeological site. The main gate is located on the northern side of the hill and is easily accessible either by foot (from the village) or by car. The other gate is located to the west and is again easily reachable. You may accomplish your visit in one go by entering the main gate and visit all places of interest or in two parts: first you visit the “middle city”, which is the lower part of the fortified city, by entering the main gate; and then you visit the “upper city”, by entering the western gate. If you do this in one day you do not have to pay twice: the same ticket is valid for both entries. Entrance fee is €12 (€6 for senior visitors/ free for visitors aged under 18 years old). Plan of Mystras after works by G. Millet (1910) and M. Chatzidakis (1981). The recommended walking tours were added. Red circular line shows the walking tour of the middle city and its detours (orange lines). Green and yellow lines show the walking paths to the upper city. The tour in the middle city takes at least 2 hours to be completed. The tour in the upper city takes from 30min to 2 hours, depending on your decision to visit the Citadel or not. The museum Complex. The main entrance to the fortified city (top left). The complex of the Metropolis and the Museum (top & middle right). The entrance to the complex (middle left). Aghios Demetrios church (bottom left) and the museum building (bottom right). Enter the main Gate (1) of the fortified city. The ticket booth is located just after the entrance on your left hand. Do not forget to get your free map of the archeological site. Following the red line at the picture above, after passing the tickets booth turn right and follow the path to the complex of Metropolis (Aghios Demetrios) and the Museum (2). The Metropolis was the Despotate’s seat of ecclesiastic administration. The Church of Aghios Demetrios, originally built as a three-aisled basilica (1262-1272) but later reconstructed with an inscribed, five-domed cruciform added above (1st half of 15th cent. ), making it resemble the Church of Panagia Hodegetria (see below), has pride of place in the complex. Note: the numbers into parenthesis next to the buildings in the text correspond to the numbers on the Plan of Mystras _after works by G. Millet (1910) and M. Chatzidakis (1981)_ seen above. View of the Evrotas valley and Sparta. The museum complex is in the foreground. Continue the path and you see the Church of Evangelistria (3) on your left hand (2nd half of 14th cent.). Continue the path (orange detour) to visit the church of Aghioi Theodoroi (4) and Panagia Hodegetria Church (5). 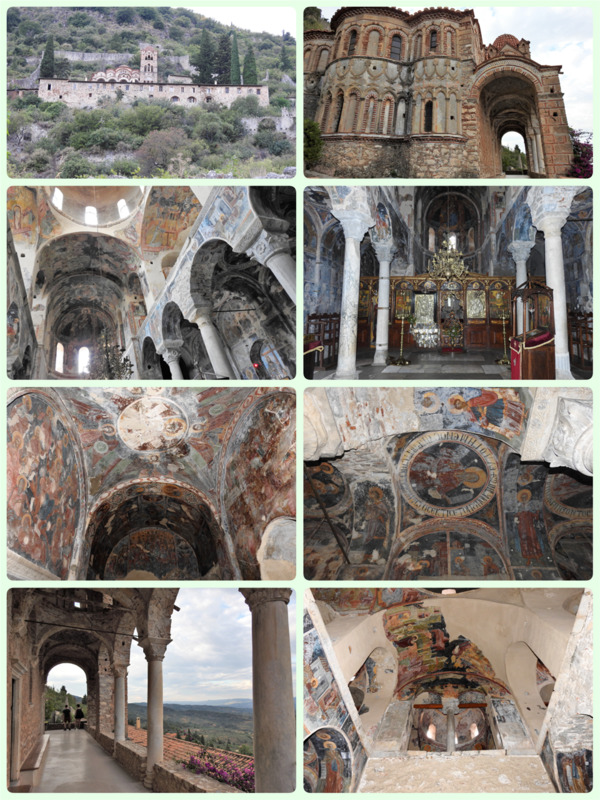 These two churches belonged to the oldest and wealthiest of the Mystras monasteries, Brondocheion Monastery, which was founded by Abbot Pachomios. 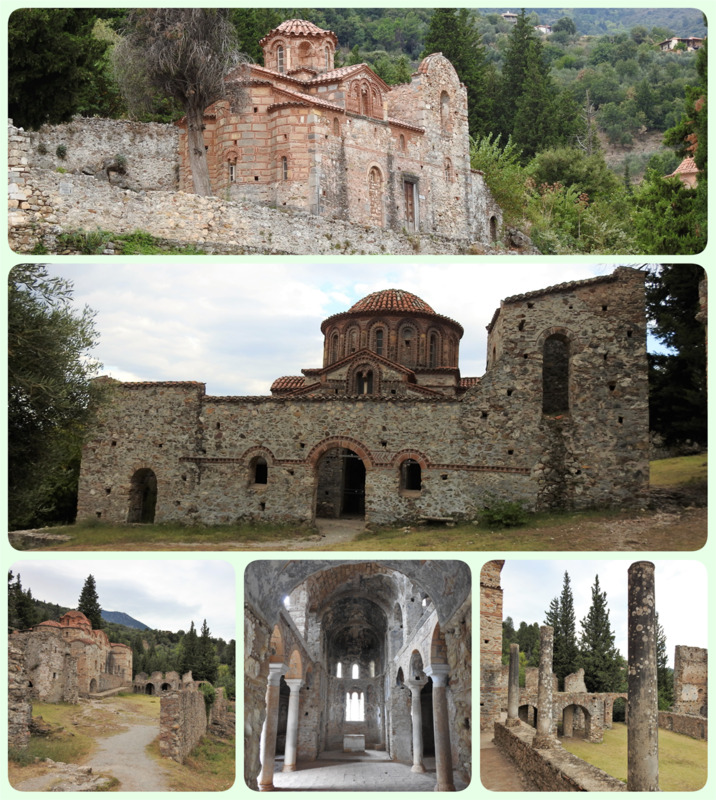 The church of Panagia Hodegetria (circa 1310), which was the monastery’s katholikon, was the first of the churches to be built in the so-called Mystras type – a three-aisled basilica on the ground floor with an inscribed, five-domed cruciform above. Go back to where you left the main path and continue uphill. The church of Evangelistria (top). The church of Aghioi Theodoroi (middle). 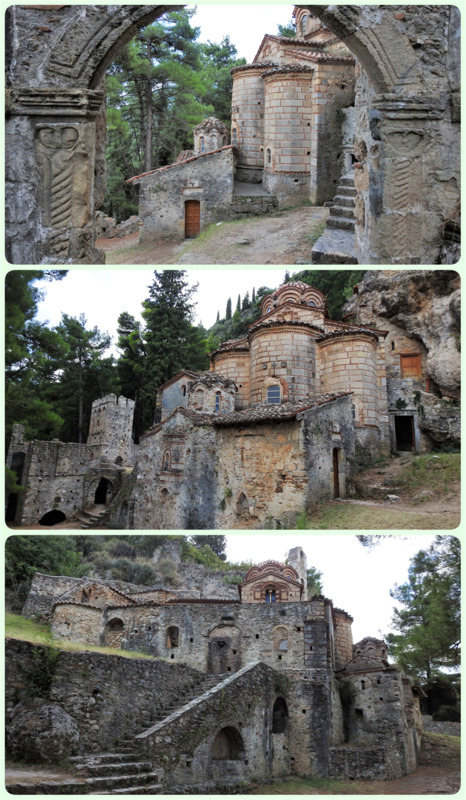 The church of Panagia Hodegetria (bottom 3 pics). The path from Brondocheion Monastery to Monemvasia Gate. The Monemvasia Gate (top left). The Aghios Nikolaos Church (top right). The Palace Complex (bottom 2 pics). Leave the main path and take the detour that takes you under the Monemvasia Gate (6) to Aghios Nikolaos Church (9) and the Palace Complex (8). 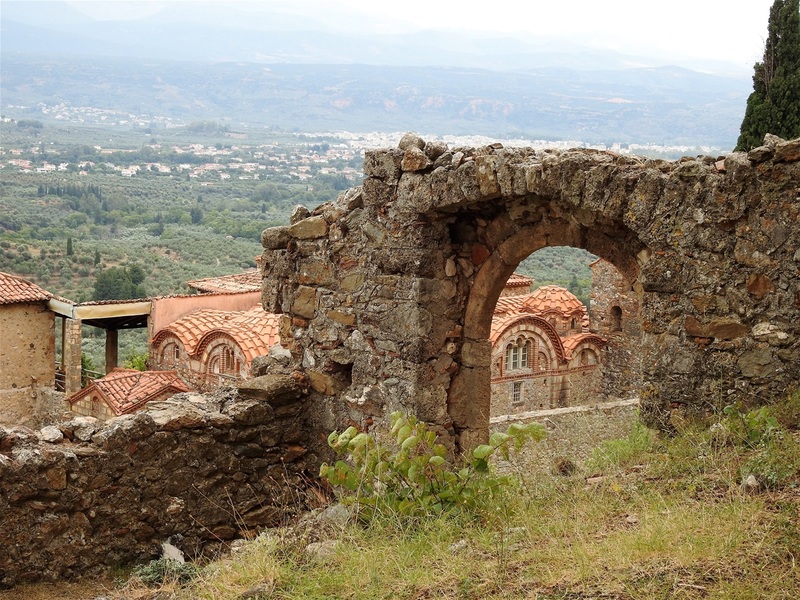 The palaces of Mystras are the only surviving example of Byzantine palace complex in the whole of Greece. The complex was the seat of the Depot of Moreas and consists of a group of buildings specifically designed for different purposes (dormitories, store-rooms, dining galls, reception rooms, administrative suites, and such like), built between the 2nd half of 13th cent. and early 15th cent. The complex today is closed due extensive restorations. Back to the main path to visit the Monastery of Panagia Pantanassa (15). 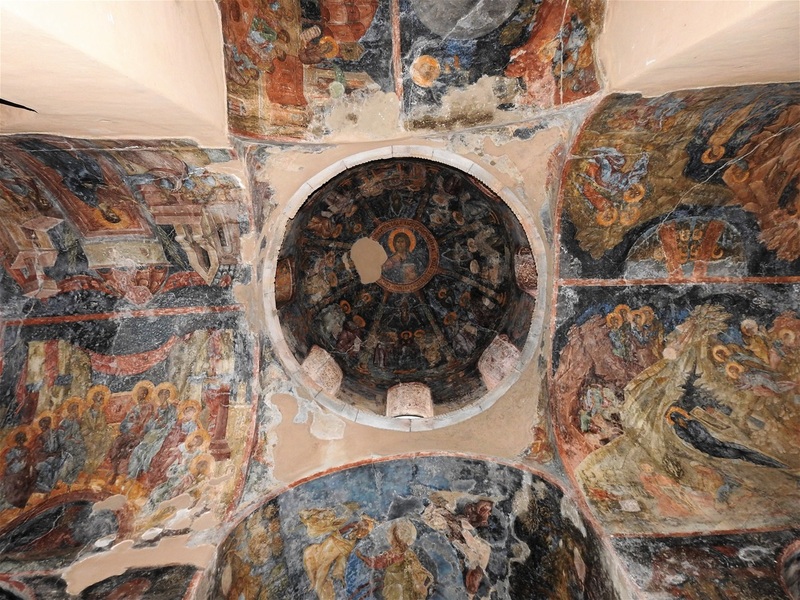 In the katholikon of Panagia Pantanassa monastery, you can see western decorative features that the artists of Mystras adopted. The church was founded in 1428 by Ioannis Phrangopoulos. Ioannis Frangopoulos was of a noble family of Fourth Crusade Venetian origin, he was protostrator and katholikos mesazon (chief minister) under the Despot of the Morea Theodore II Palaiologos. The buildings are now used as a convent. 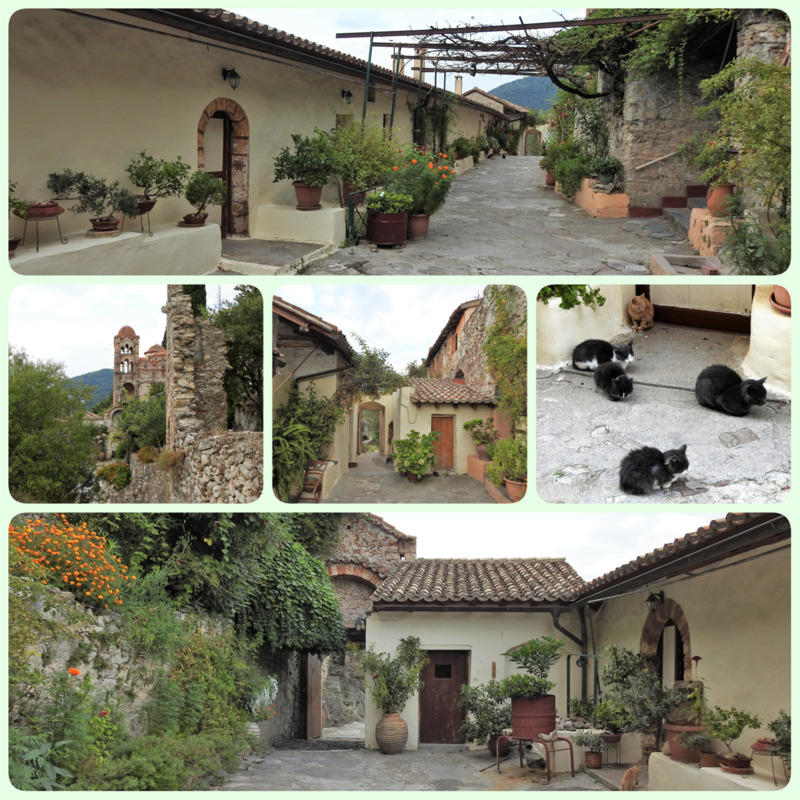 I believe the cats of the monastery are the real stars here! The Monastery of Panagia Pantanassa. The entrance to the Monastery of Panagia Pantanassa. The katholikon of the Monastery of Panagia Pantanassa. Walk for a while downhill to reach the Peribleptos Monastery (18). 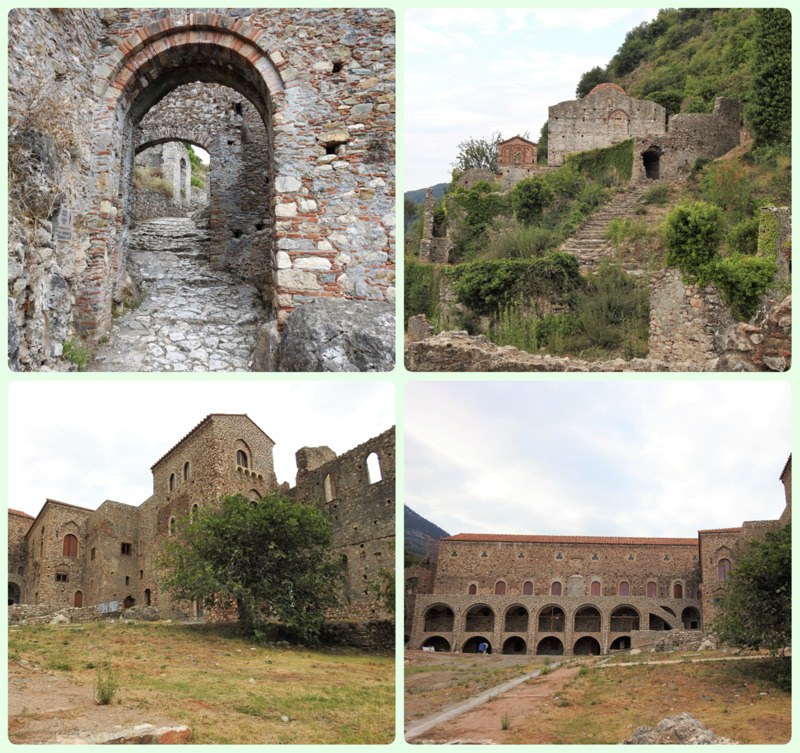 Peribleptos founded by Manuel Katakouzenos (1349-1380) first Depot of Mystras and his wife Isabelle de Lusignan. The Monastery is built into the side of a cliff with a cave supporting the structure. 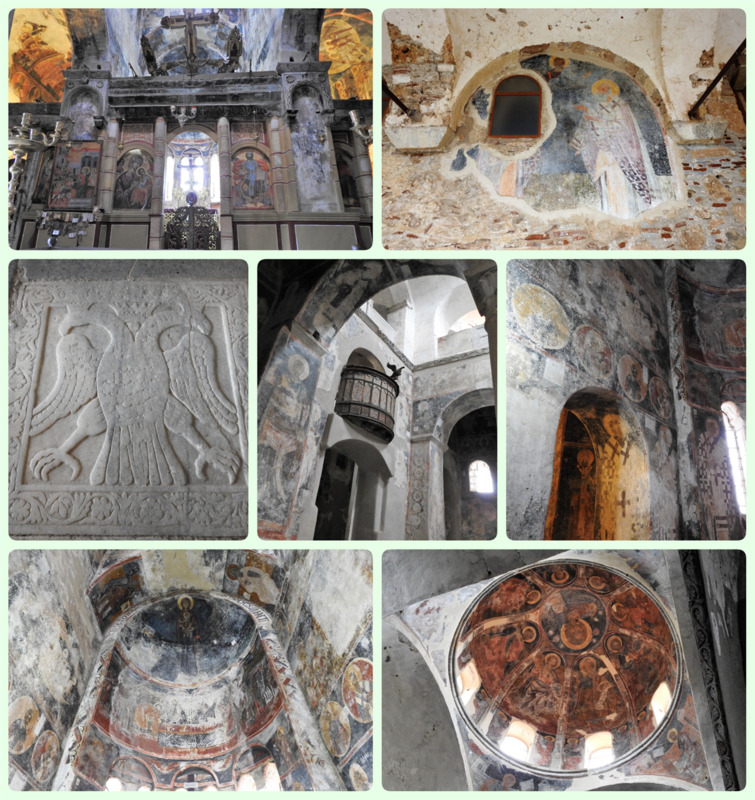 The extensive frescoes covering the interior of Peribleptos Monastery were created from 1350-1375. These works have been connected with the Cretan and Macedonian art schools. As art historian Annie Labatt says: "space and movement are treated with a Western feel in these frescoes". Because of the apse and other surfaces that create dramatic spatial surfaces, the artists' that painted these works had the advantage of displaying New Testament images with a perpetual flow with one fresco leading into another. It is unclear who the artists were. Dedication to the Virgin Mary has been proven as a prominent iconic focus in the religious art in churches and monasteries in Mystras. In Peribleptos Monastery, Relics include a fresco of Saint John the Baptist in a scene of The Baptism of Christ. Another notable relic is the head of Saint Gregory of Nazianzus, 4th-century Archbishop of Constantinople. The frescos at the Peribleptos monastery! 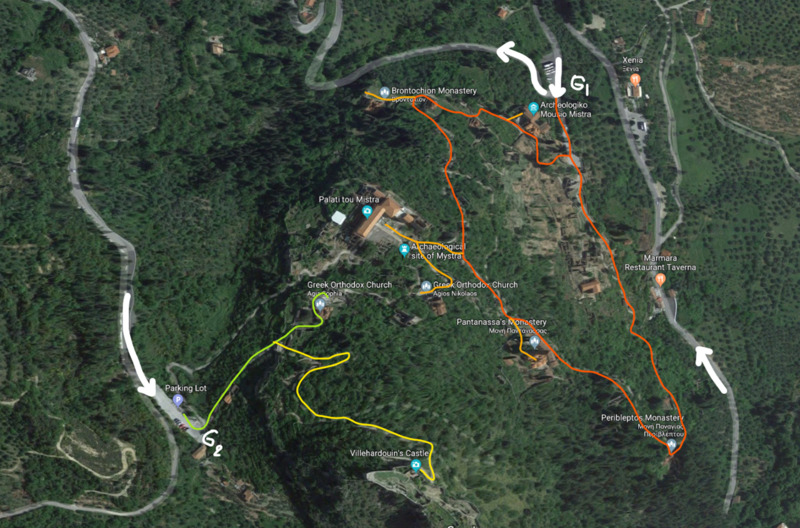 Finish the lower part of the circular path by heading towards the exit (main gate) passing by the church of Aghios Georgios (19) and the “Laskaris house” (23). The Laskaris house together with the "house of Ioannis Phrangopoulos" (17) are the two most impressive houses in the city. Scattered here and there on the hill are a few more private houses that survive in good condition and provide insight into aspects of residents’ day to day life. View of the Palace complex and the Citadel on the way to the western gate of the fortified city. Leave the middle city, drive your car for some kilometers around the hill till you reach the western gate of the archeological site. On your way there you can enjoy great views of the fortified city, and mainly the Palace Complex and the Citadel. This part of your visit is simple but not any easier. The western gate to the fortified city. Enter the gate, show your ticket at the ticket booth (if it was bought the same day) or buy a new one and continue downhill to visit the Church of Aghia Sophia (11). The church of Aghia Sophia, a two-column cross-in-square domed church, was directly related to the palace. 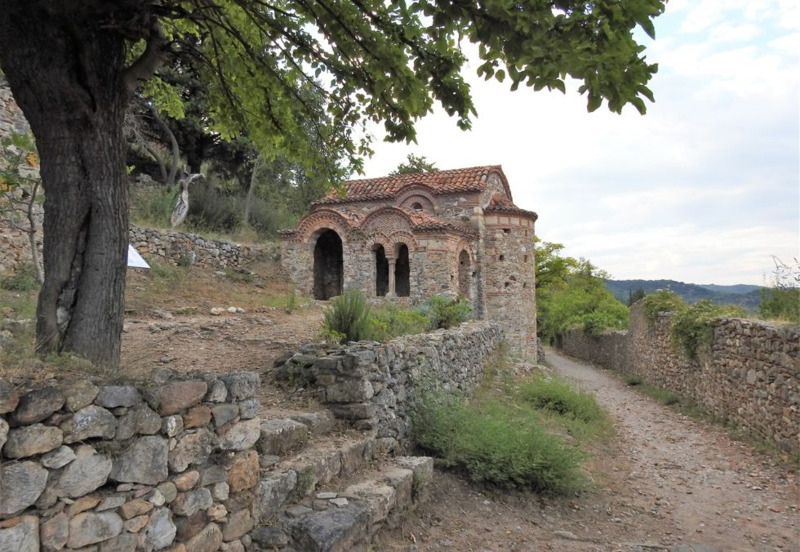 Initially the katholikon of a monastery, identified as the Monastery of Zoodotes Christos founded by the despot Manuel Kantakouzenos around the middle of the fourteenth century, the church was used as a palace chapel. Its sculptures, reused to a great extent, have been dated to the end of the twelfth or beginning of the thirteenth century, and have parallels in the templon of the church of Samarina in Messenia. The northeast chapel is sepulchral, while the southeast (built after 1366) has been associated with Isabelle de Lusignan, wife of the despot Manuel Kantakouzenos, and its painted decoration has been attributed to the same workshop that decorated the Peribleptos. Indeed, the decorative program, with its particular emphasis on the scene of the Birth of the Theotokos, was connected to Isabelle’s desire to bear a child. The Citadel stands at the very top of the hill. Back to the ticket booth and take the green path uphill to the Citadel (13). This is maybe the hardest part of your visit, as the Citadel is located at the very top of the hill (620 m high). 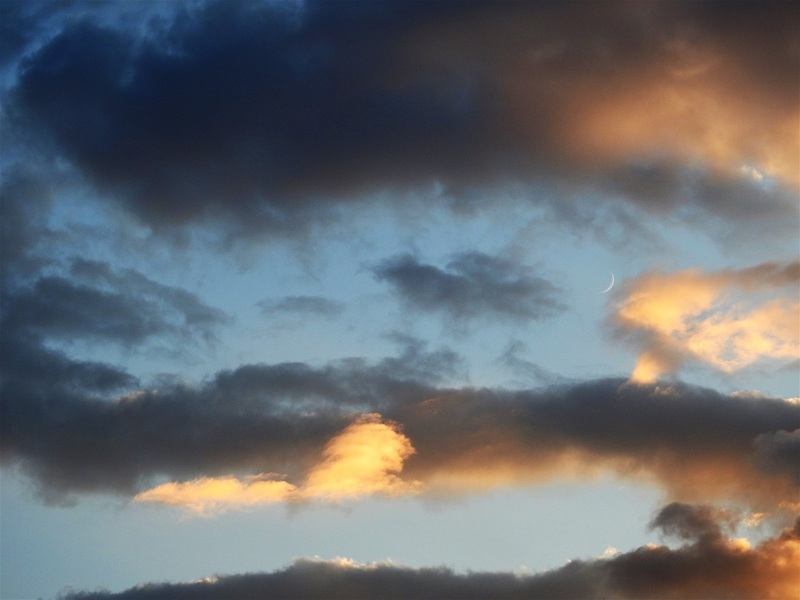 But the reward is huge when you reach up there: the views are stunning. This archeological site is certainly one of the most awarding I have visited so far. The reconstructions are continuous so that the visitor gets a better and better insight into the life in a late Byzantine city. 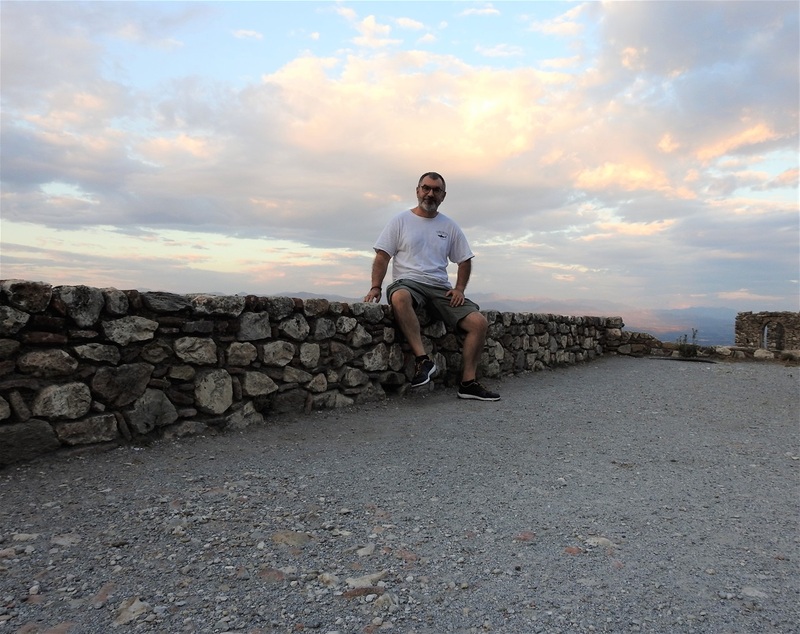 Last time I visited Mystras was in 1983…35 years ago. I was a high school student those days and I had not much interest in history, like most teenagers I presume. I do not remember anything from those days, but I am so glad I decided to come back and really appreciate the glory of this amazing place. 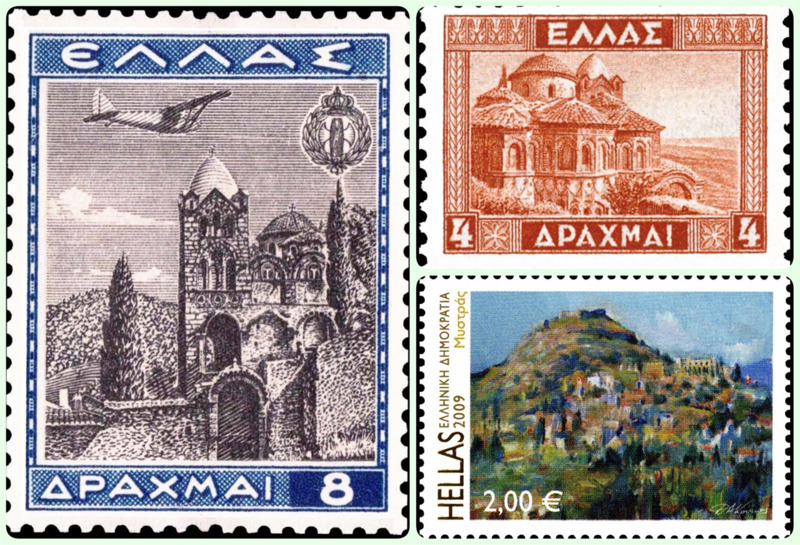 Greek post stamps from 1940 (left), 1935 (top right) and 2009 (bottom right).